‘Diversity’ at leading US Colleges? Certainly not, if one looks at the diversity of opinion. 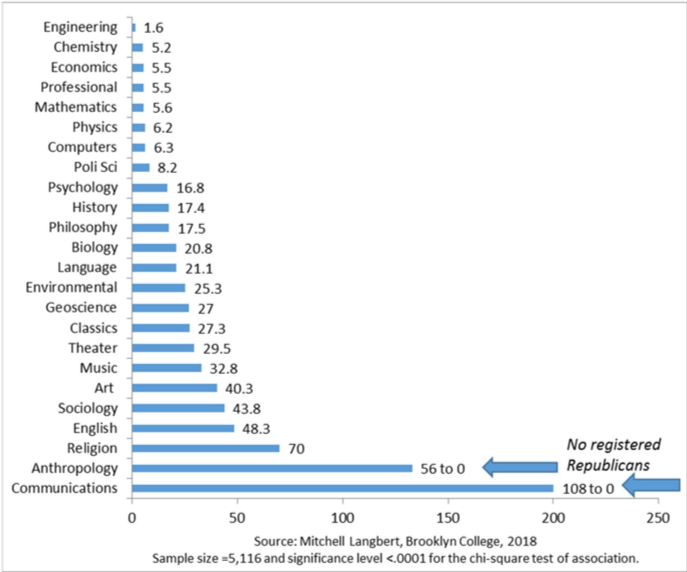 New research compares the party affiliation of 5197 professors at elite US colleges. The lowest Democrat to Republican ratio is in the Engineering departments: 1.6 (that is, 1.6 times as many Democrats as Republicans). Anybody still wondering about the shift to the left in public opinion and among political leaders? The above data shows that this shift to the left will probably be even more pronounced in the future: tomorrow’s leaders are currently being educated at elite US colleges where there is an overwhelming rule of leftist thinking, even in natural science departments like physics and biology, often enough enforced through authoritarian measures.